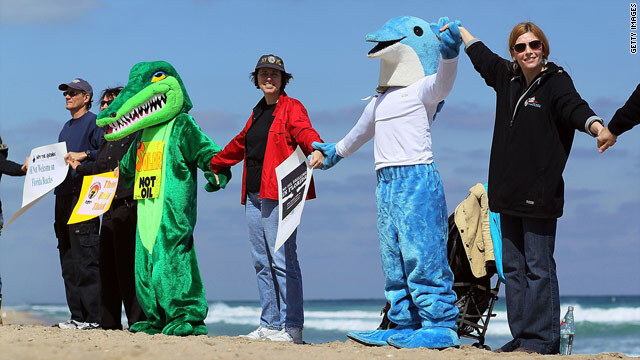 Demonstrators opposed to offshore drilling near Florida protest in Fort Lauderdale, Florida, in February. Washington (CNN) -- Several environmentalists expressed disappointment and dismay Wednesday over President Obama's decision to open key Atlantic and Gulf of Mexico waters to oil and gas drilling. "I'm extremely disappointed," said David Rauschkolb, a Florida restaurant owner who organized anti-drilling rallies last month at several Gulf Coast beaches. "Florida's legacy is clean water, clean beaches, sunshine and tourism. Every oil rig is a threat to tourism and coastal well-being. ... All it takes is one spill." One leading critic of offshore drilling, New Jersey Democratic Sen. Frank Lautenberg, vowed to fight Obama's plan. 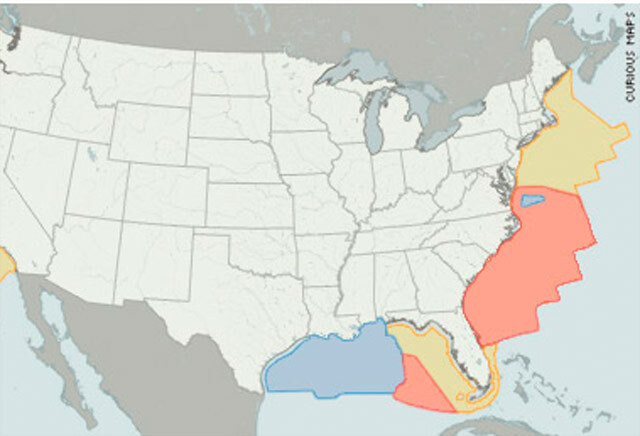 Drilling off the mid-Atlantic coast will endanger many of his home state's beaches and coastal economies, Lautenberg said. "An oil spill could create severe damage to coastal areas up to 500 miles from the location of the spill," he warned. But Florida Democratic Sen. Bill Nelson -- generally an opponent of offshore drilling near his state -- said Obama's plan was a step in the right direction compared to other proposals under consideration. The president's plan would prevent drilling within 125 miles of the Florida coastline; an alternative proposal being pushed in the Florida legislature would allow drilling within 3 miles of the coast. "I've talked many times to [Interior Department] Secretary [Ken] Salazar and told him if they drilled too close to Florida's beaches they'd be risking the state's economy and the environment," Nelson said. "I believe this plan shows they heeded that concern." Wesley Warren, a director at the Washington-based Natural Resources Defense Council, told CNN there are both positive and negative aspects to the president's plan. "We disagree with the proposals for the outer continental shelf [in the Atlantic] that open the door for development," he said. But, he quickly added, he's pleased that the White House has withdrawn from consideration environmentally sensitive areas on the West Coast -- including Alaska's Bristol Bay. Warren said he's not surprised by the president's move, recalling that "as a candidate he said he would consider greater development." Warren recommended, however, that the White House shift its focus. "We would urge [the administration to] direct attention to real clean-energy solutions, including finalizing clean-fuel standards and developing renewable energy sources." Because the president's proposal would open Atlantic coastal waters to drilling, Warren believes the plan "should be subjected to more extensive study of the environmental and economic risks." A climate change group founded by former Vice President Al Gore in 2006 was sharply critical of the president's plan. It "continues our reliance on dirty fossil fuels, we cannot simply drill our way to energy security," said Maggie Fox, president of the Alliance for Climate Protection. But another environmental organization said Obama's plan could boost support for passage of a climate change bill in Congress. "Now it's time for supporters of new drilling ... to step forward and support comprehensive legislation -- including a limit on carbon pollution," said Steve Cochran, climate campaign director for the Environmental Defense Fund. Rauschkolb, a self-described beach lover who has surfed for 33 years, said he's certain the president's pronouncement won't be the last word. "It doesn't make sense," he said. Rauschkolb told CNN he's working with fellow environmentalists to mount a June protest in Virginia Beach, Virginia.